St Julian's, Malta started life as a fishing village, but in recent years has developed into a fashionable resort town full of hotels, restaurants and bars. 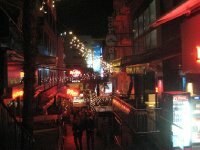 Just north of St. Julian's is Paceville, with a vibrant nightlife. St. Julian's is centred around a number of bays and inlets. Around Spinola Bay, you can still see a number of fishing vessels, and see fishermen on the dock mending their nets, just steps from restaurants overlooking the bay filled with colourful boats. The Church of Our Lady of Mount Carmel sits on the bay front of Balluta Bay. There is a public beach at St. George's Bay, just north of Paceville. There is a casino at Dragonara point beside the Westin Dragonara Resort. The casino is built in Villa Dragonara, once the private home of a 19th century Maltese aristocrat. From the airport, take the main road following the signs to Valletta. Take the Sliema Exit and follow the signs to St. Julian's. As of July 2011, bus service on the islands were taken over by Arriva. The old buses dating back to the British period that plied Malta's streets have been replaced by new buses. Buses are operated by Arriva, and schedules and routes can be found on the Arriva Malta website. Tickets can be bought on board, and fares run from €2.20 for a 2-hour ticket, €2.60 for a day pass or €12.00 for a 7-day pass for non-Malta residents. Routes servicing St. Julian's and Paceville include routes from Valletta (13, 24, 31 and 32) and from the airport (X2). The main nightlife can be found around Bay Street, and Triq Santa Rita, with numerous bars and pubs. A resort town, there are numerous hotels throughout St. Julian's. We have a comprehensive list of accommodation in St. Julians searchable right here on Travellerspoint. You can use our map to quickly compare budget, mid-range or top of the range accommodation in St. Julians and areas nearby. This is version 13. Last edited at 3:53 on Aug 2, 17 by sleepBot. 1 article links to this page.